Develco has participated in a a project with Innovation Network Smart Energy / Inno-SE with the purpose to apply research-based knowledge in companies within the energy technological sector. During the annual meeting 2018 Develco presented the results from two projects: EnergyBig with test of LoRaWAN technology for data collection of energy consumption and EnergyBigger with optimization of antennas. 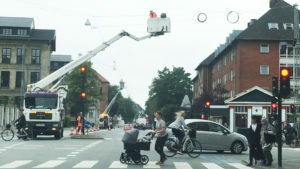 In cooperation with Frederiksberg Forsyning, SEAS-NVE, DELTA and Ingeniørhøjskolen Aarhus Universitet Develco has tested the wireless technology LoRaWAN for data collection over longer distances and in different environments: in cities and the country. SEAS-NVE built a test laboratory utilizing a LoRaWAN Gateway in the city Svebølle for reading of consumption of water, electricity and heating and several other types of sensors placed at varios spots in the city. The advantage is savings in energy and time as the data collection takes place online with encrypted data in the Cloud instead of manual reading of data. The results with Big Data from remote reading have exceeded the expectations. Already now the energy companies can harvest data and within approximately one year they will be able to convert and utilize these data. The positive results from the two projects will be used for the construction of infrastructure for Smart City solutions in cities and municipalities.